Port Elizabeth residents Knut and Christine Hildebrand were in Cape Town for a few days and invited us out to tour the winelands with them. We enjoyed a wine-tasting, estate tour and picnic lunch at the famous Boschendal Estate, the second-oldest winery in South Africa. 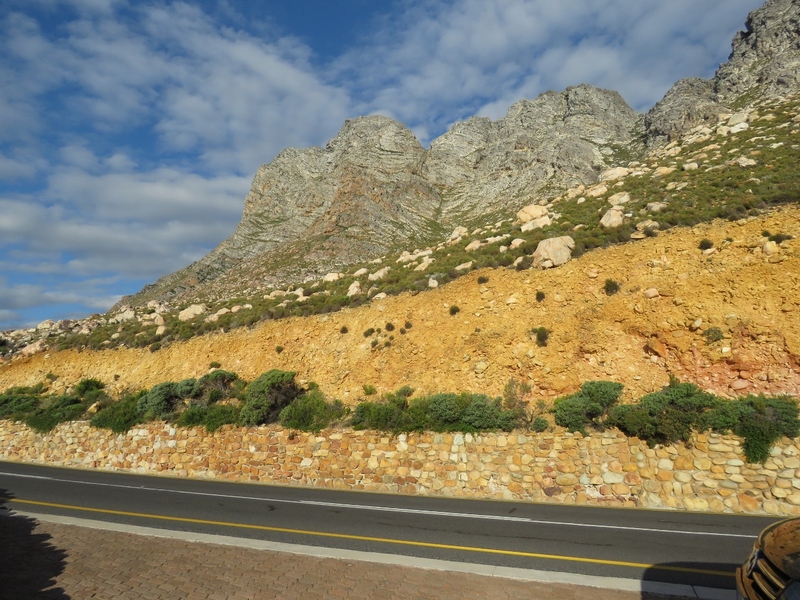 The scenery in the winelands valley and en route back along the caost was fabulous, and we got a chance to see huge numbers of penguins at the Stoney Point Penguin Colony. Thanks to Knut and Christine for an excellent day. 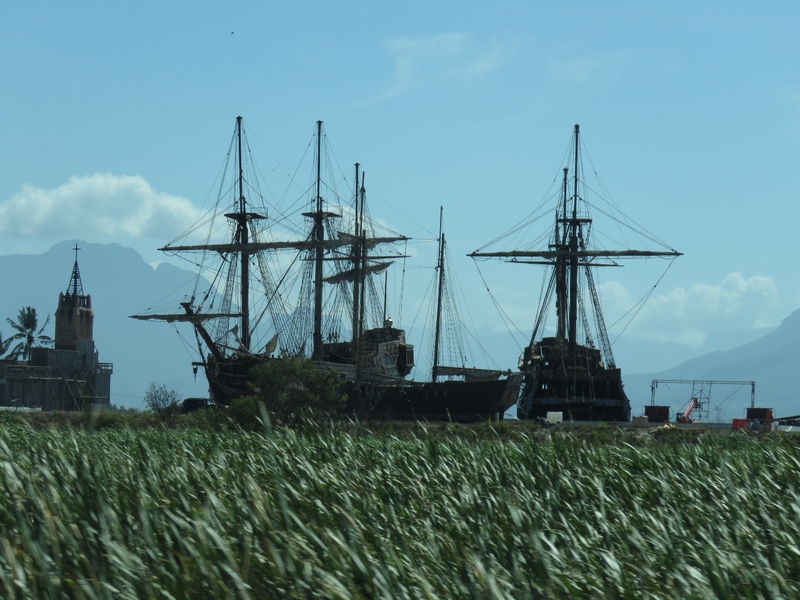 On a trip out to the winelands, we were surprised to see several ship’s masts in an inland field. 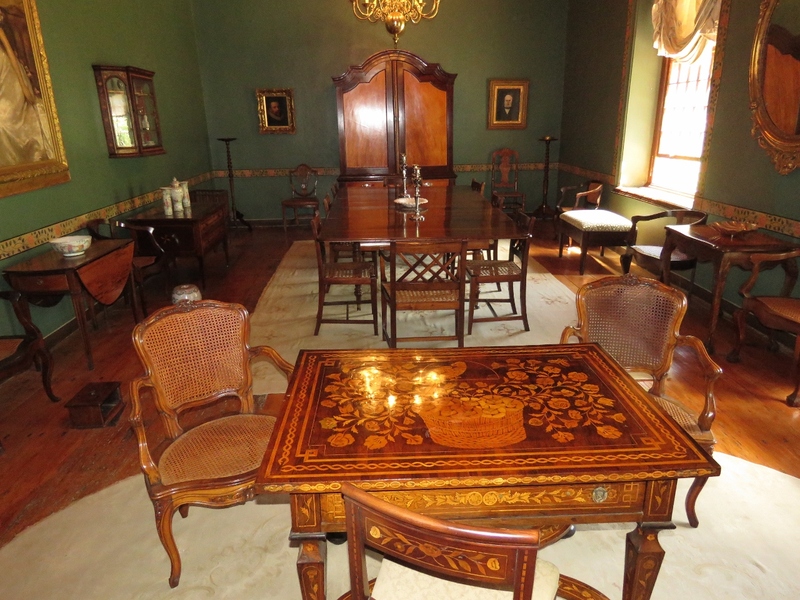 This turned out to be the set for the US television series Black Sails, filmed at Cape Town Film Studios. 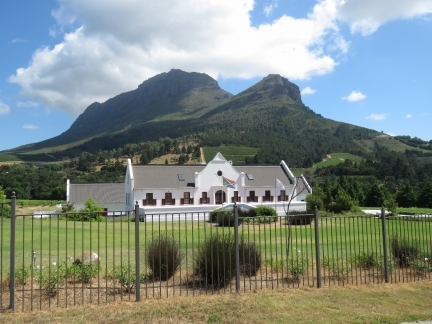 The Zorgvliet Wines buildings display the Cape Dutch Afrikaner architecture found mostly in the Western Camp region of South Africa and particularly in the wine district. Boschendal Estate, founded in 1685, is the second-oldest winery in South Africa. 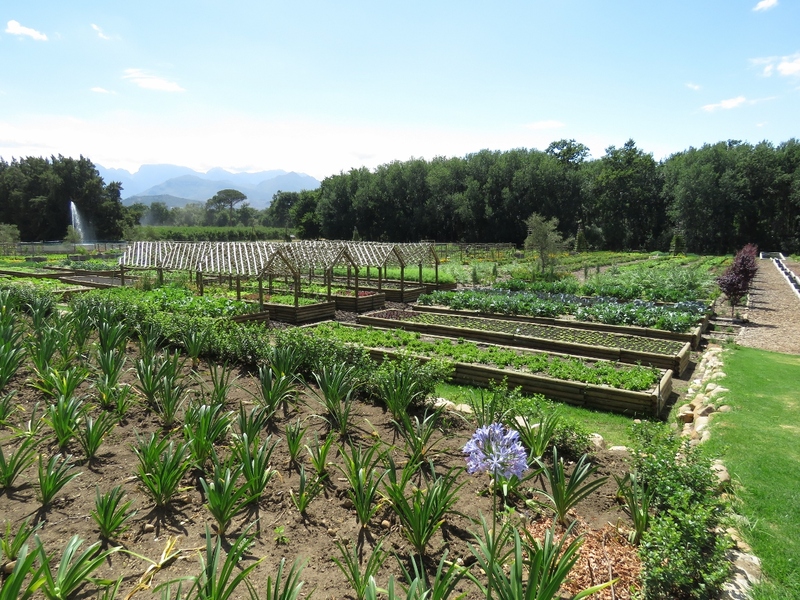 Like many of the wineries in the area, Boschendal has an excellent restaurant supplied through an on-site organic garden. 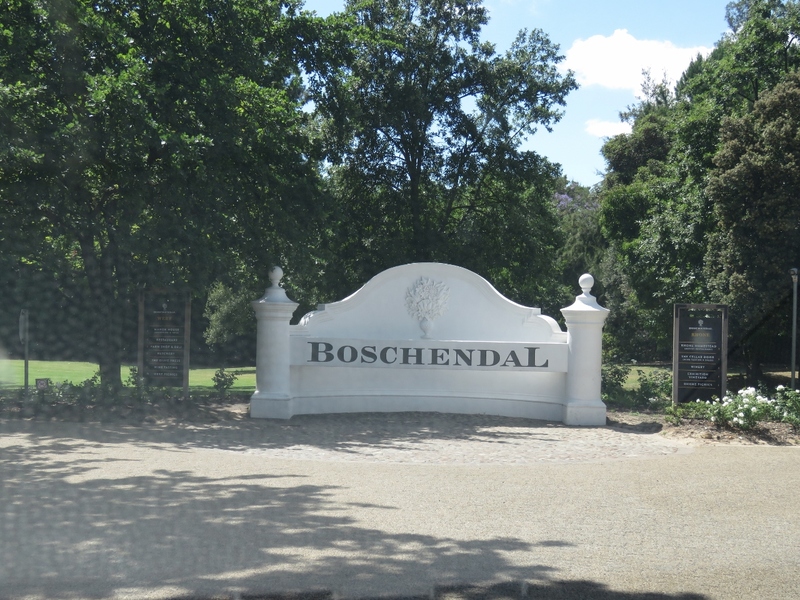 We did a tasting of five excellent Boschendal wines. 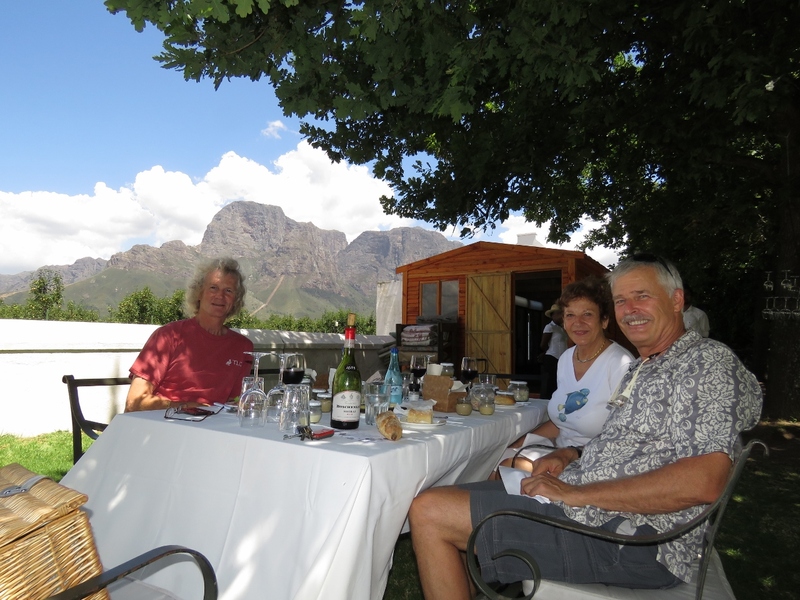 With us are Knut and Christine Hildebrand, current owners of Nordhavn 4710 Wofanu. Their boat, then called Kelly Ann, and Nordhavn 4715 Oso Blanco were the first two Nordhavn 47s we’d ever been aboard. Seeing the two boats at the 2004 TrawlerFest in Poulsbo Washington sparked our strong interest in the Nordhavn 47 that eventually led to our our 2009 purchase of the 52, a similar model to the 47. 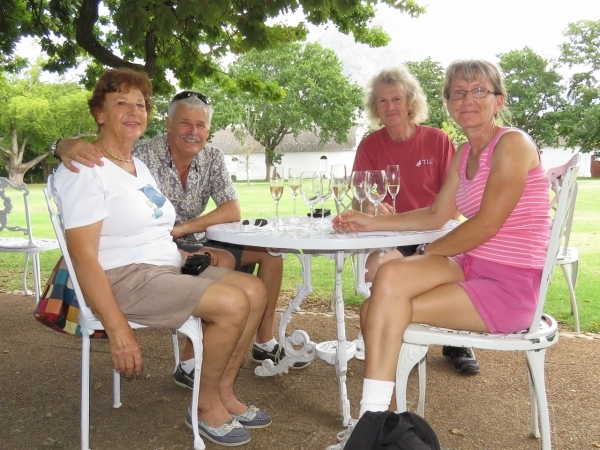 Knut and Christine live in Port Elizabeth, South Africa. They were in Cape Town for a few days and invited us out to tour the winelands with them. We took a guided tour through the vineyard up into the hills above the farm. 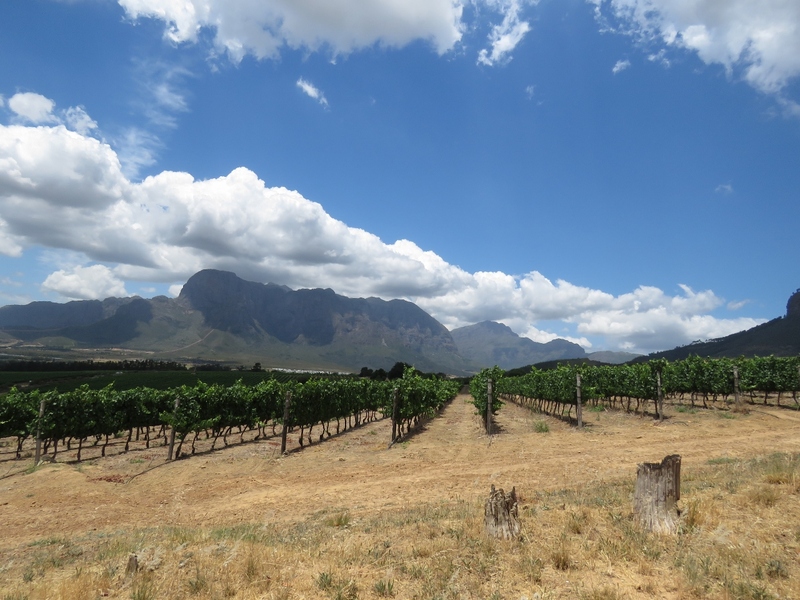 Here we are passing Sauvignon Blanc vines that grow best in the higher altitude and shadow of the mountain behind. 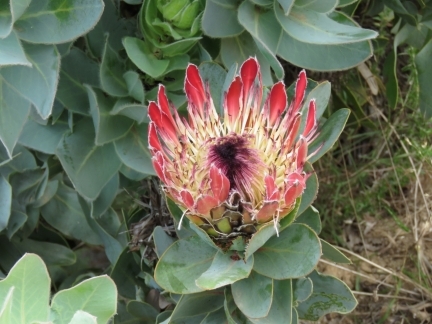 A few fabulous King Pretoria, South Africa’s national flower, still were in bloom along the road. 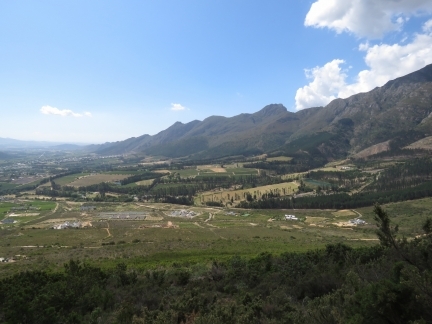 The view into the valley from the slopes above the vineyard. Much of the visible land is part of the extensive 2,400 hectare Boschendal estate. 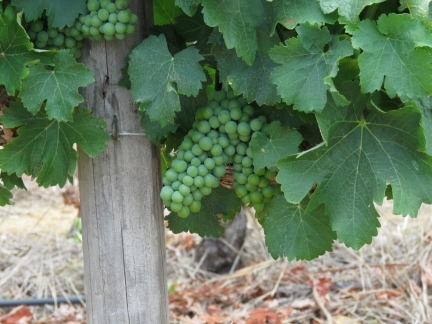 Sauvignon Blanc grapes on the vine. 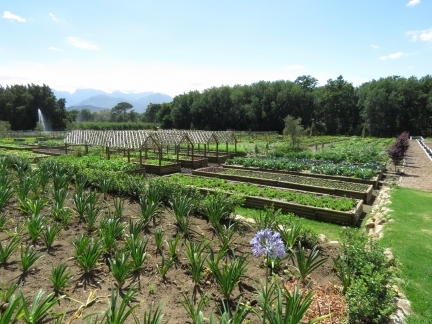 They’ll be harvested in a few weeks. 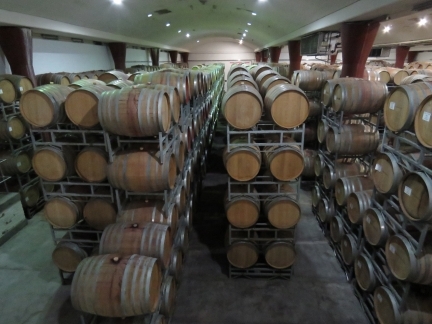 Hundreds of barrels of red wine aging in oak casks. The wonderful Boschendal picnic lunch basket included bread, cheeses, sliced meat, pate and several salads. And we of course had a bottle of wine to accompany it. 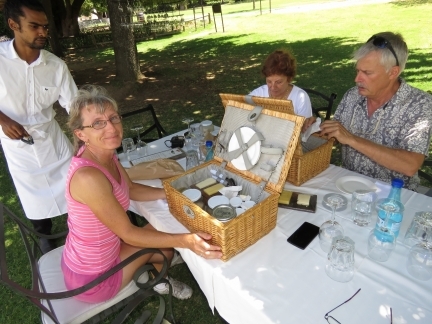 Our decadent picnic lunch on the lawn at Boschendal with incredible mountain scenery on both sides. 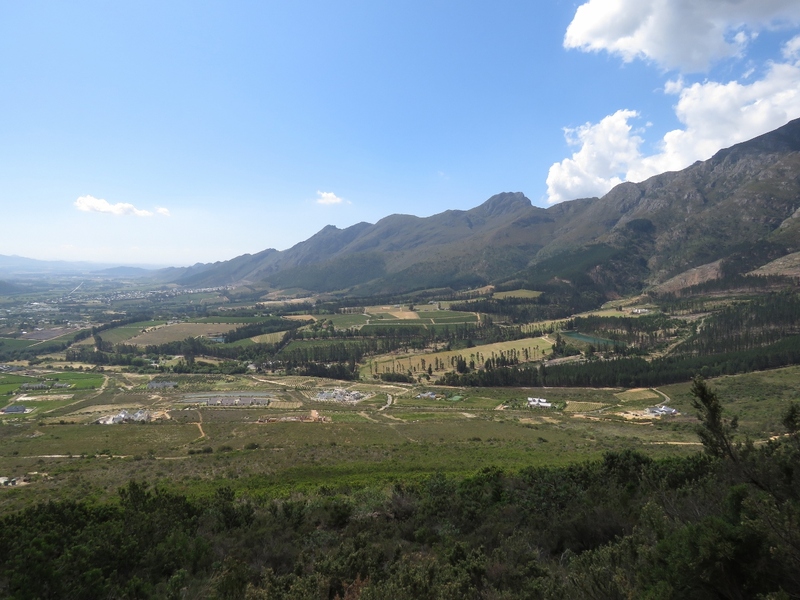 The view looking down into the Drakenstein Valley from the road above Franschhoek. Franschhoek Pass reminded us of some of the twisty, winding roads in Reunion. 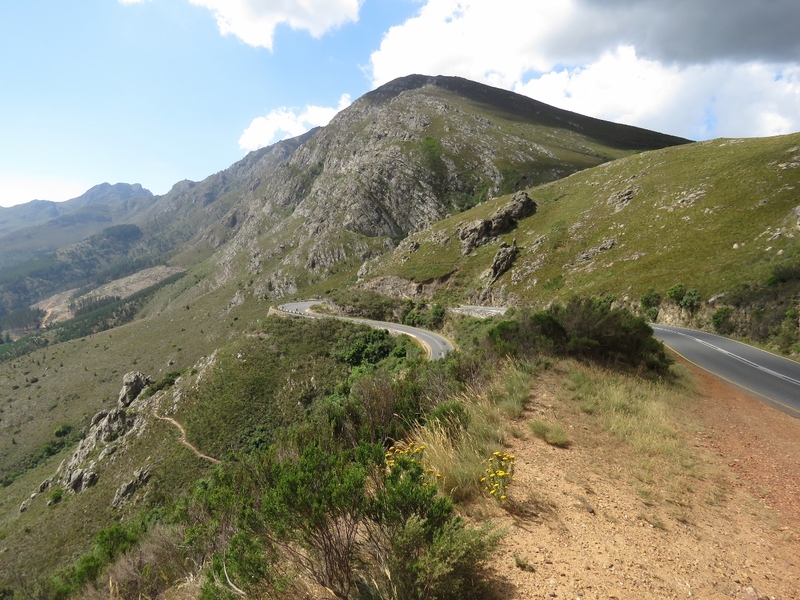 The views were similarly impressive too. 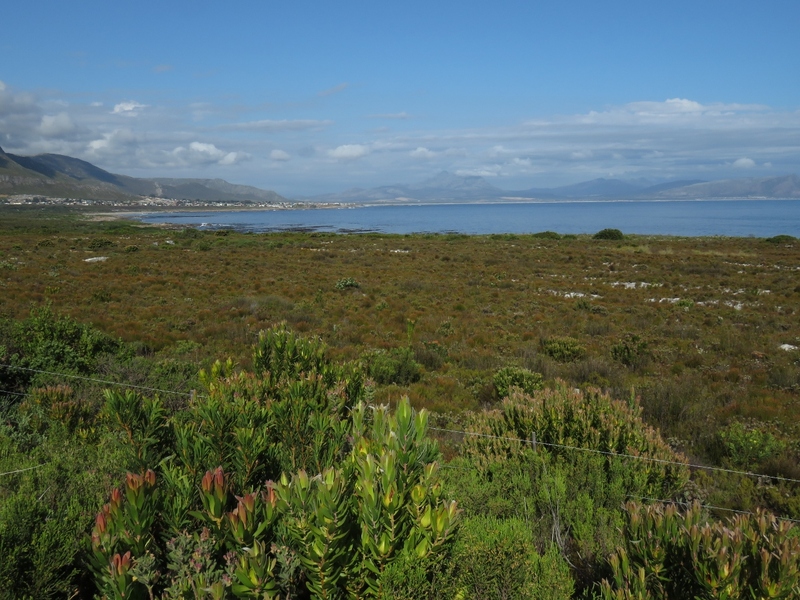 We arrived at the coast through Kleinmond Coastal Nature Reserve. This is the view southwest across the reserve with the Birkenhead Peninsula in the distance. 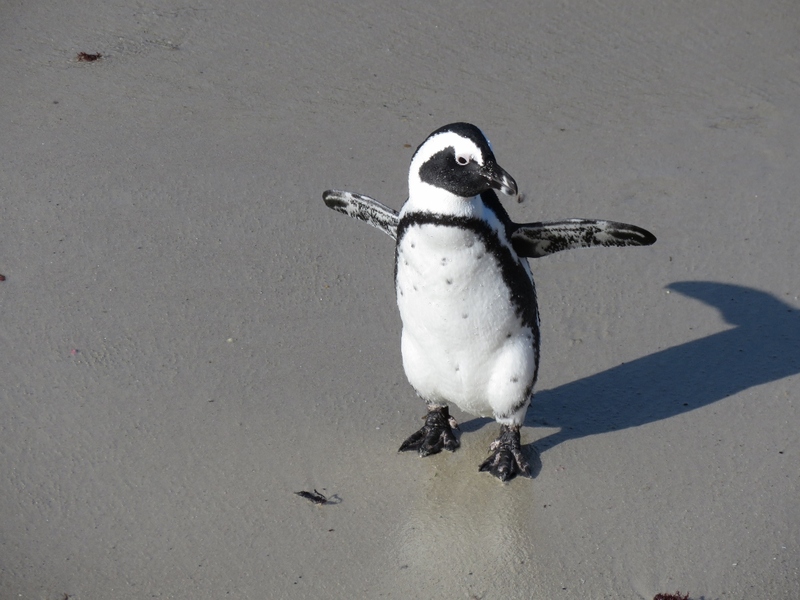 Only two African Penguin colonies exist on the South African mainland, one at Boulders Beach near Simon’s Town and the other here at Stony Point. 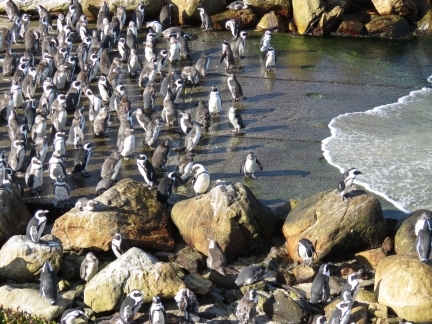 We’d arrived in the late afternoon, a perfect time to view the penguins after they’d returned from a day of fishing at sea. 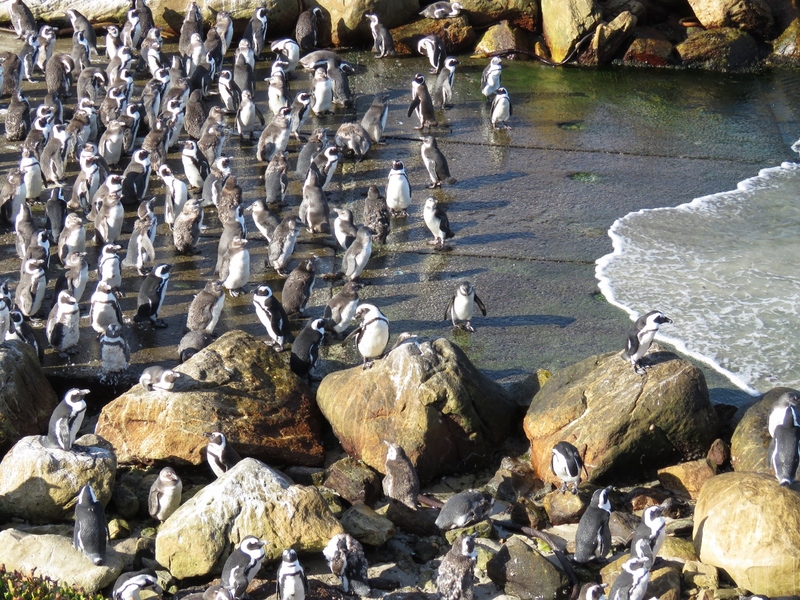 The beaches were packed with the delightful birds whose donkey-like call gave them the nickname Jackass Penguin. The penguins were adorable–we spent ages watching them. 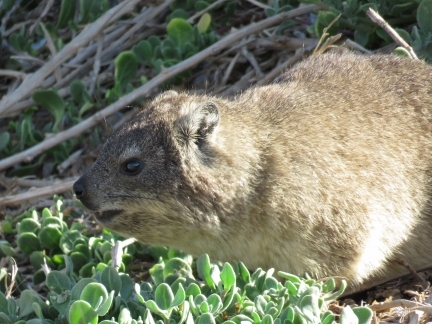 Stony Point also is home to many Rock Dassie, who are unbelievably the closest relative to the elephant. Several Dassie were feeding in the grass above the penguin colony. 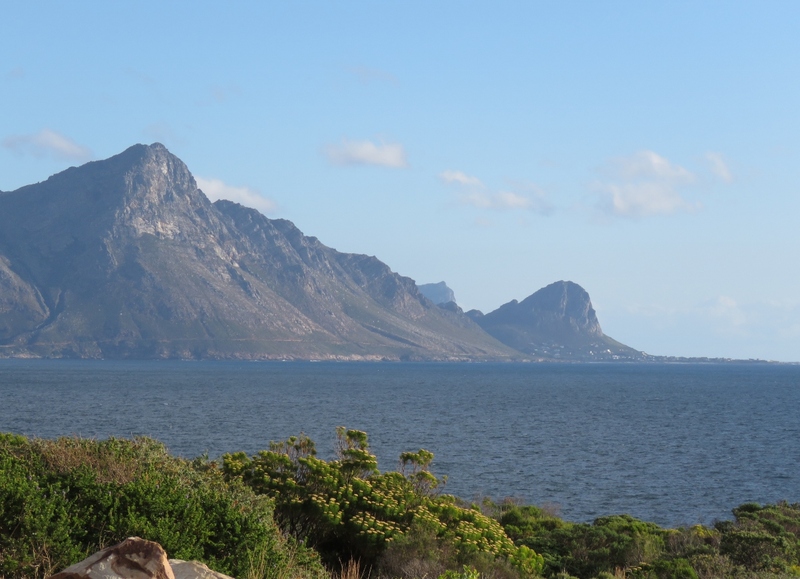 Looking east to the Koelberg Mountains from the road along the eastern shore of False Bay. Distinctive Hangklip Mountain rises to our south above Pringle Bay at the right of the photo, with the Koelberg Mountains on the left. The scenery all day has been just amazing. On the map page, clicking on a camera or text icon will display a picture and/or log entry for that location, and clicking on the smaller icons along the route will display latitude, longitude and other navigation data for that location. 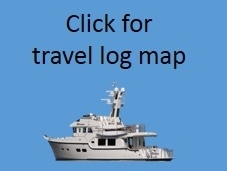 And a live map of our current route and most recent log entries always is available at http://mvdirona.com/maps. Glad to see you and Jennifer are having a wonderful time in SA. Hoping you both have a very Merry Christmas and a wonderful start on the new year! Thanks and all the best to you in 2016 Stewart. Your plans sound good Brett. We basically did the same thing and, wow, what an adventure it’s been. 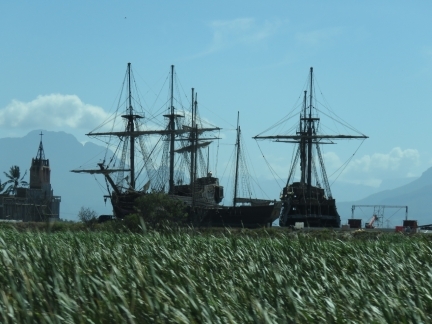 The Black Sails film set suggests a second series is in the offing. I imagine that Amazon`s offering of films and its own streamed video productions has driven a huge expansion of server from capacity and that this keeps you busy. Amazon.com is certainly a big and important AWS customer but, as big as they are, the Amazon.com portion of the AWS workload doesn’t come close to dominating the AWS load patterns.